sepex(regen). Also if sepex which version regen 1 or 2 and IQ. 1. Does the Golf Cart have a Tow/Run switch or Run/Maintenance switch? This would be under the seat. 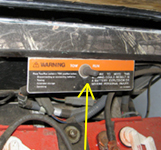 If the cart DOES have this switch, it is a Regen (Regenerative Braking) cart. If there is NOT a switch, then its a Series cart. Club Car Series Cart Features. 3. Does the motor have a speed sensor wire protruding from the end head? If the answer is YES, then it is a Regen motor. If there is NO speed sensor lead on the motor, then it is a Series motor. 4. Are there 2 smaller diameter (1/4-20 UNC) terminals and 2 larger diameter (5/16-18 UNC) terminals on the motor? Or are all 4 terminal studs on the motor the same size (5/16-18 UNC)? If there are 2 smaller and 2 larger terminals bolts, its a Regen motor. If all 4 bolts are the same size, then its a Series motor. 5. What do the motor Field Coil Windings Look Like? 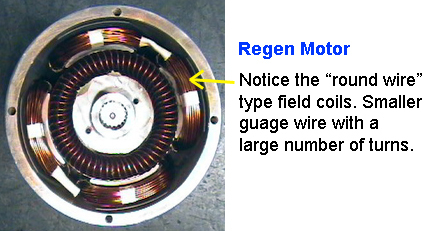 a. Regen motors have "shunt" or "round wire" coils, usually with smaller gauge wire (12AWG - 24AWG range). Usuaully, with a large amount of turns (60 to 200+ turns) per field coil. b. 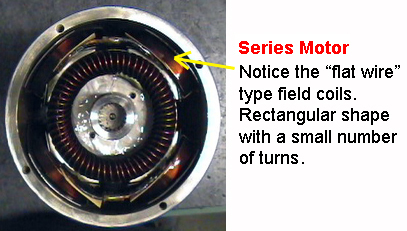 Series motors have "flat wire" coils with larger wire sizes. Usually, the wire is rectanular in shape (cross-section). These coils have a much lower number of turns (usually 5 to 15 turns) per field coil. Note:	A Regen cart will normally automatically slow down when you hit approximately 15 MPH going down a hill. This is for safety reasons (as not to over-spin the armature).